Herb Zehnder was born on May 10, 1924, in Baden, Pennsylvania. He enlisted in the U.S. Army Reserve on May 27, 1943, and entered the Aviation Cadet Program of the U.S. Army Air Forces on June 13, 1943, receiving his appointment as a Flight Officer and his pilot wings on November 20, 1944. After serving in the U.S. the last year of World War II, FO Zehnder left active duty and went into the Air Force Reserve on November 5, 1945. He then enlisted in the U.S. Army Air Forces on September 16, 1946, and remained on active duty in enlisted status while at the same time receiving his commission as a 2nd Lt in the Air Force Reserve on October 29, 1946. Sgt Zehnder served as an enlisted Air Traffic Control Tower Operator from September 1946 until he received his commission in the Regular Air Force on August 21, 1951. He then served as an Air Traffic Control Officer with the 1933rd Airborne Air Control Squadron (AACS) at Ernest Harmon AFB, in Newfoundland, Canada, from August to October 1951, followed by service as an Air Traffic Control Officer with the 1932nd AACS at Goose Bay in Labrador, Canada, from October 1951 to January 1952. His next assignment was as an Air Traffic Control Officer with the 1917th AACS at Westover AFB, Massachusetts, and with the 1862nd AACS at Tinker AFB, Oklahoma, from January 1952 to March 1953, and during this time he completed helicopter pilot training at San Marcos AFB, Texas, from October to December 1952. Lt Zehnder served as an H-19 Chickasaw pilot with the 83rd Air Rescue Squadron in France and West Germany from March 1953 to September 1954, and then as an Air Traffic Control Officer with the 1237th AACS at Spangdahlem AB, West Germany, from September 1954 to February 1956. His next assignment was as an H-13 Sioux helicopter instructor pilot with the 3588th Flying Training Squadron at Edward Gary AFB, Texas, from March 1956 to September 1957, followed by service as a helicopter pilot with the 4756th Air Defense Wing at Tyndall AFB, Florida, from September 1957 to October 1961. Capt Zehnder served as a CH-21 Workhorse helicopter pilot with the 1001st Helicopter Squadron at Bolling AFB, Washington, D.C., from October 1961 to June 1963, and during this time he flew VIP transport for cabinet members and Defense Department officials in the Washington, D.C., area. Maj Zehnder served as Officer in Charge of Helicopter Operations with the 4500th Air Base Wing at Langley AFB, Virginia, from June 1963 to April 1964, and then as a helicopter pilot with the 4486th and 4488th Test Squadrons, and then the 4401st Helicopter Squadron, at Eglin AFB, Florida, from April 1964 to December 1965. His next assignment was as a CH-3 Jolly Green Giant helicopter pilot with the 20th Helicopter Squadron at Tan Son Nhut and Nha Trang AB, South Vietnam, from December 1965 to December 1966, followed by service as an HH-3E pilot with the 48th Rescue and Recovery Squadron at Eglin AFB from December 1966 to February 1969. LtCol Zehnder served as Chief of Technical Training with the Aerospace Rescue and Recovery Training Center at Eglin AFB from February 1969 to February 1971, and during this time he served as copilot of the HH-3 "Banana One" that landed Blueboy Assault Group in the POW Courtyard during the Son Tay Raid, a clandestine mission to rescue American Prisoners of War in North Vietnam on November 21, 1970. Col Zehnder next served as Commander of the 67th Aerospace Rescue and Recovery Squadron at RAF Woodbridge, England, from February to December 1971, followed by service as Director of Operations and then as Vice Commander of the 40th Aerospace Rescue and Recovery Wing at Ramstein AB, West Germany, from December 1971 to January 1973. He served as Commander of the 3rd Aerospace Rescue and Recovery Group at Tan Son Nhut AB, South Vietnam, and then at Nakhon Phanom Royal Thai AFB, Thailand, from January 1973 to January 1974, and then as Vice Commander of the 39th Aerospace Rescue and Recovery Wing at Eglin AFB from January 1974 until his retirement from the Air Force on September 1, 1975. Herb Zehnder died on March 4, 2008. On June 1, 1967, he commanded the lead helicopter of a two-helicopter flight that made the first non-stop crossing of the Atlantic Ocean by helicopters, flying from New York to Paris. Lieutenant Colonel Herbert R. Zehnder distinguished himself by gallantry in connection with military operations against an armed enemy of the United States as a Helicopter Pilot during the Prisoner of War search and rescue operation at Son Tay, North Vietnam, on 21 November 1970. On that date, Colonel Zehnder volunteered to rescue and extract United States military personnel held as Prisoners of War deep inside the territory of North Vietnam. 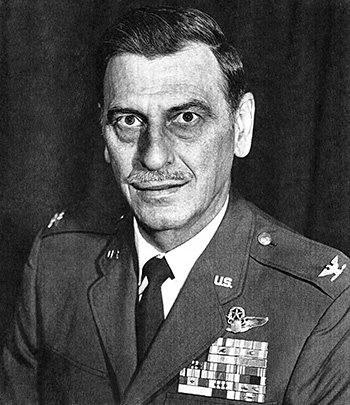 Colonel Zehnder was faced with the most intense counter-air environment in the history of aerial warfare involving surface-to-air missiles. He flawlessly executed the necessary complicated maneuvers to evade the enemy's air defense systems. Knowing that a grave danger existed in that the guards within the Prisoner of War compound may have been alerted, he valorously, fearlessly, and successfully flew the helicopter with members of an assault group into the compound yard, knowing that he must crash-land the helicopter in an area much too small for safe landing. Once the landing was completed, he further assisted the assault group in its ground operation mission. By his gallantry and devotion to duty, Colonel Zehnder has reflected great credit upon himself and the United States Air Force.